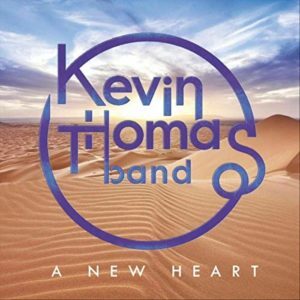 Singer/songwriter/guitarist Kevin Thomas has released his new album under his Kevin Thomas Band moniker, called A New Heart. With a rotating cast of players behind him, we get ten solid ditties here that all pop, groove, and deliver. “The Big Picture,” opens, with its sly, slightly stuttering snare beat and great guitar work, both rhythm and lead. The chorus sets us up for lots of what follows, very singable tunes. “Comfort Zone,” and then “Time,” pick up the grooving, even more, the former with a piano pushing it, the latter, a funky popping bass, and organ wash. And throughout we are getting choruses we can sing along to. “Let Your Arrow Fly,” marks the beginning of some great conga/percussion-influenced stuff, with “Mirror, Mirror,” one of the better vocal tracks (Thomas certainly has a very distinct voice) mining an almost child-like sing-song in its chorus; it’s very effective. The piano here is great too. “High On Chocolate” is one I absolutely love. It’s got a snapping snare, organ slipping in, percussion and such sly lyrics. “On My Way Out” sees a slight change to what we have heard throughout, still grooving yes, but it’s mid-tempo and features a fiddle. Again Kevin places his musicians around him perfectly and mines a real mature sound and vocal delivery here to create a vibrant stew. The press for this release claims that the San Diego, California-based singer-songwriter Thomas has started a new chapter with the release of A New Heart. Whatever is happening in his life, it is reflected here in a very solid release.